Last year we gave you our top ten beauty resolutions suggestions for 2012. This time around we decided to change it up by asking people around the Sigma office what beauty resolutions they have for the coming year. (You might even recognize some names from our previous tutorials!) Keep reading to find out how we plan to have a beautiful 2013! Tara, General Manager & PR Manager – drink a ton of water, wear all of the lipsticks, lip gloss and other lip products that I seem to have accumulated throughout the years, and try out different color eyeliners. Amanda, Makeup Artist & Product Development Manager – take better care of my hands – apply lotion every day! And to have better posture. Shauna, Marketing Manager – have a whiter smile and to find my signature red lip color; nothing is classier than a perfect red lip and a white smile, in my opinion. Tonya, Marketing Coordinator – keep my brushes more organized and in perfect condition! The Brush Cup Holder and Dry’n Shape are going to be my go-to products this coming year! Jeanette, Marketing Coordinator – try some of the looks featured in the Defining Eyes Palette by Tiffany D booklet. Thera, Marketing Coordinator – clean out my makeup bag and clean my brushes weekly. Annie, Affiliate Program Manager – pay better attention to beauty product expiration dates! Jenny, Affiliate Program Coordinator – take better care of my skin by wearing SPF, moisturizing, and cleaning my makeup brushes regularly. Kristina, Affiliate Program Coordinator – really focus on taking care of my skin and finding a good regimen that I can maintain. Vincy, Affiliate Program Coordinator – drink more water and less coffee to refresh my skin, and to take my makeup off every night. Jessica, Affiliate Program Coordinator – get out of my rut! Every day I do the same look on my eyes (‘Chase’ from the Dare Palette, brown liquid liner, and mascara). 2013 is going to be filled with color! Erica, Associate Creative Director – limit my intake of processed foods and sugars -- I want my skin to glow for my wedding! Janae, Graphic Designer – get better at washing my face every single night. Rachel, Online Partners Manager – really get a skin care routine down and stick to it. With my thirtieth birthday not far off, I want to achieve a polished glow, significantly slow any future aging, and just look and feel healthy. I believe healthy skin is your best beauty asset! Paige, PR Coordinator - find my signature look and to take better care of my skin! Kaitlin, Wholesale Program Coordinator – create the perfect brows everyday with my Beauty Expert - Brow Design Kit! 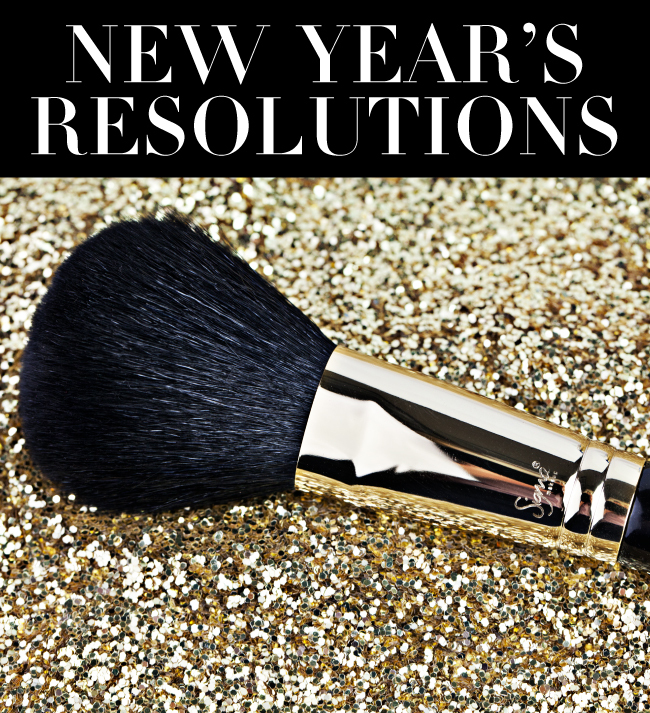 Now that you know some of our beauty resolutions, we’d love to hear some of yours! How are you planning to improve your beauty routine for 2013? Drink lots of water and sleep at least 8 hours. I need to invigorate my skin this year.